Frankly, I was slightly disappointed in this as I’ve really enjoyed the previous books in the Michael Kelly series and was looking forward to this one. There is enough in this book to keep me waiting for number 5 but …… there should be more than that. Opening chapters rely too much on you appreciating who the characters are and their roles from the preceding book and when there’s a gap since you read the previous entries in the series this leaves you struggling a little. The pace does pick up at the end for a dramatic conclusion but the inclusion of an ex-cop PI in the middle of a nuclear, biological, chemical (NBC) attack jars from the outset I guess and never adequately convinces. The parts that work best for me are the interplay between the mayor & Kelly and also between Kelly and Rodriquez. These hark back also to the parts that I loved about the rest of the series. When you start getting into NBC, Homeland Security & martial law you just wonder about how easy it is for Kelly to walk around the quarantine zone. Maybe I was slow to spot the connections but possibly this would have worked best as an out and out conspiracy thriller rather than a whodunnit that morphs into a conspiracy. 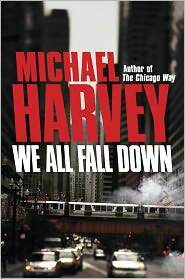 Won’t exactly set the world alight with this one but Michael Harvey is a good writer and even a relatively poor entry from him is still probably better than a lot of the other novels out there. Overall, this isn’t the best entry in the series so while I would still highly recommend the series as a whole you’d be far better off starting out with “The Chicago Way” and going from there.